HKS Max Twin-Plate комплекты сцепления. The HKS GD Clutch Max is the latest evolution of the HKS multi-plate clutch series. The GD Clutch Max features the same multi-plate design and lightweight flywheel of the GD Clutch Pro, but also features a sprung hub (on most applications) and special engagement springs (patent pending). The sprung hub absorbs engine torque which helps increase the life of the transmission, and aids in decreasing gear noise. The HKS GD Clutch Max is the latest evolution of the HKS multi-plate clutch series. The GD Clutch Max features the same multi-plate design and lightweight flywheel of the GD Clutch Pro, but also features a sprung hub (on most applications) and special engagement springs (patent pending). The sprung hub absorbs engine torque which helps increase the life of the transmission, and aids in decreasing gear noise. The engagement springs are placed between two pressure plates and the center plate. --- They force the clutch plates to engage one at a time. Doing so makes it easier to slip the clutch, improving street drivability and clutch control. The HKS multi-plate performance clutch kits are vehicle specific Pull-Type racing clutch applications designed for street-car use. The multiple plate design allows increased friction area and direct power transfer, thus offering greater horsepower and torque holding capacity and light clutch pedal pressure for easier clutch pedal management. The use of rivet-less clutch disks allow for better durability, increased friction area and direct torque transfer, while maintaining a friction material that is both wear and heat resistant. Each multi-plate clutch kit comes with a lightweight chrome-moly flywheel optimizes durability and high performance. The use of very durable and lightweight chrome-moly material with a steel tooth ring makes it possible to construct a thinner flywheel without sacrificing integrity. The concept behind a lightweight flywheel stems from the desire to enhance low-rpm throttle response on high RPM horsepower applications. With the lightened flywheel in the HKS Twin and Triple Plate Clutch kits, a quick rise in RPM can be attained from light throttle input for easier RPM matching when downshifting and to counter low torque at low RPM levels. 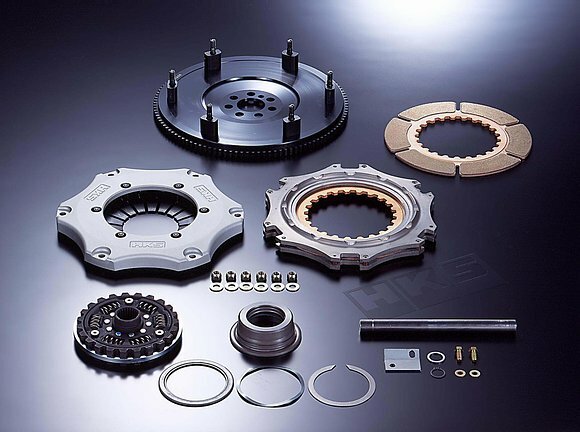 Though the main focus of the HKS multi-plate clutch kits is on ultimate power transfer and engine response, a stable idle and smooth driveability is still maintained. Each HKS Twin and Triple Plate Clutch kit is a complete vehicle specific assembly that allows for a bolt-on installation. Some applications have an available slave cylinder rod that increases travel for enhanced pedal modulation.